Every person who has scrutinized the silver screen movies Avatar and Iron Man will have an impression of the augmented reality to be brilliant and magic like. The movies had their own version of integrating digital experiences and the scenes are filmed by the use of augmented reality in a virtual digital environment. Although it was on screens, the reality is not far from it, especially when Apple’s ARKit is now making an enhancement in our reality. ARKit – Apple’s new augmented-reality platform supported in the iPhone XS / XR / 8, Apple’s latest flagship smartphones. It changes user’s current perception of reality in comparison to virtual reality as it overlays slices of the digital world on top of the real one. 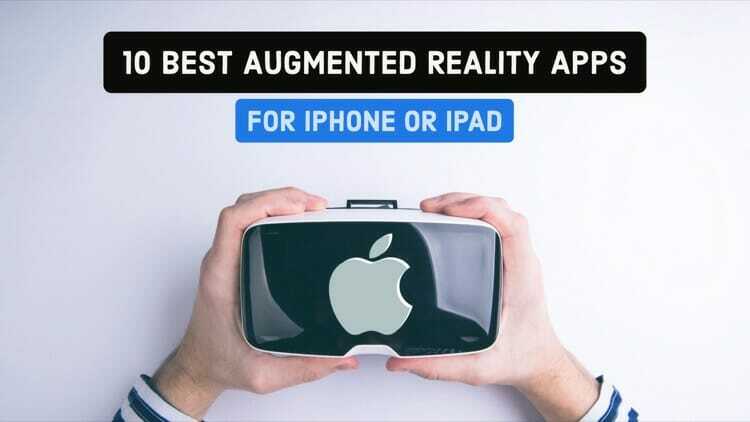 Here are some of the best AR apps for iPhone and their features. You should try out for yourself to experience the glimpse of something that would fully bloom and is inevitable in the future. Arguing with your partner while choosing the furniture is a common scenario. Be it the new house in need of furniture or replacement to the old one, confusion is bound to transpire to choose the right set of furniture. What if you can visualize how the furniture looks in your home or office and see the difference for yourself without having to face any dilemma? 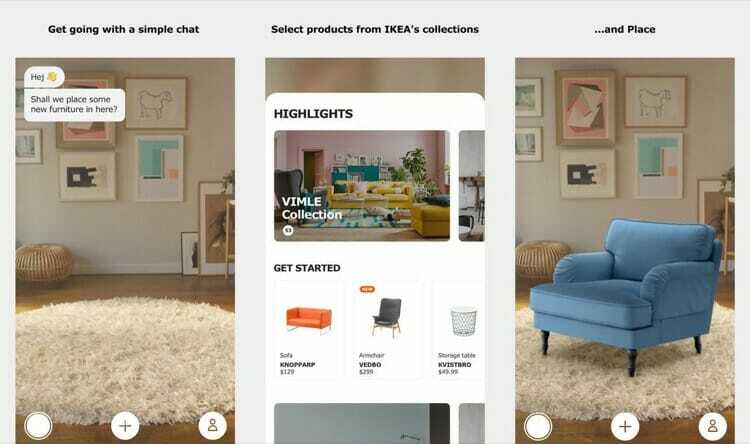 With IKEA PLACE, it is possible to place furniture or any other product virtually by dragging and dropping the product. – The app’s catalog has more than 2000 products to browse. – The app is free and there is no assembly required except your iPhone. – The app uses 3-D camera overlay due to the camera sensors that map the digital objects. Exploring iconic routes for walking or stunning routes for cycling is possible from Fitness AR app. The procedure to operate is simple and the interface is user-friendly. Opening the app, you will find a 3-D terrain map placed in the real world where you can walk, cycle, find new routes, and keep tabs on your past activities. – Zooming and tracking of routes. 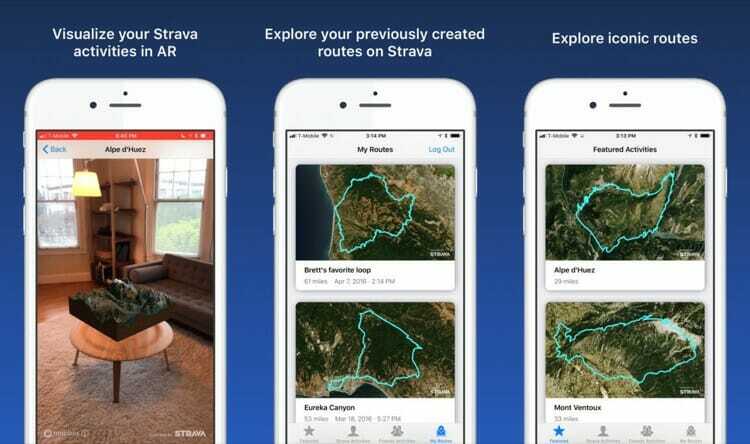 – Browsing of past activities or friend’s activities using the Strava account. Painting on a white canvas or a piece of paper is no fun for someone who is not very gifted in the area of stroking a brush elegantly. What if the world is your canvas and your fingers are the brushes to fly your imagination? With World Brush, one can paint with brushes on the world around them. The painting will be saved at the approximate GPS location where it was originally created. – There is an option to cycle through other people’s drawings. 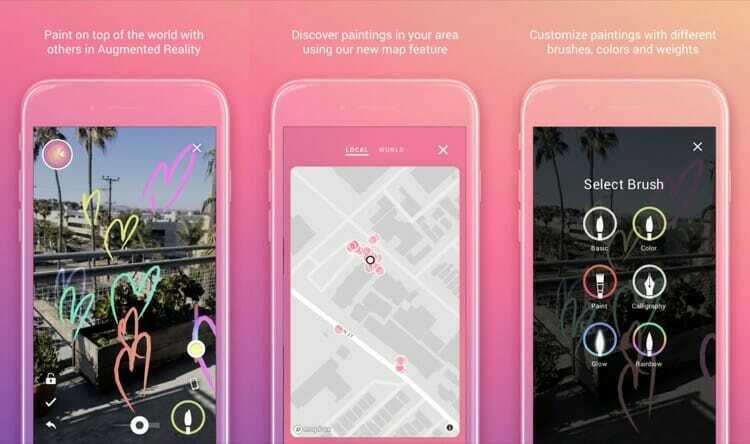 – Paintings can be shared with a friend who can view it in AR. – The new feature lets the paintings to mark as private so no one else can see them. This is one of the most useful and innovation app which can measure anything just by your iPhone camera. It has various tools which promises accuracy and can help you decide your next move in terms of measurements. – 9 Different tools for measurements which include- Ruler, Magnetometer, Trajectory, Face Mesh (Allows you to measure the dimensions of your face), Marker Pin, Angles, Person Height, Cube, and Level. – The Chaining mode in the ruler tool links multiple rulers together to measure a bigger area or surface. – It works on walls and vertical planes as well. With magicplan app in the picture, it is easier than ever to design your own floor plan like a professional. This ideal app lets you add objects, pictures, and furnish the room by providing a 3-D view of the space. – The floor plans are available in various formats such as PDF, JPG, DXF, PNG, SVG, and CSV formats. – Easy to share your plan with another magicplan user. – A training session is available to get used to the app and its application. Operating similar to a video conferencing call, Chalk is a new innovation to support the calls of tech-savvy people. With Chalk app, make doodles and explain the tech problem to your friend who is in dire need of help for solving an issue. Talking and explaining using the rear-facing camera makes it easier for the recipient to understand better. – The app is free and has the potential to develop new features. – Object detection and environment scanning during the video call. Giving a whole new meaning to the medical education, Insight Heart will carry out the human heart expedition. The app scans the physical surroundings and places the 3-D heart while the ANI guides through various states of heart. A detailed view of the heart can be seen when the device is closer to the target. – The heart can be scrutinized from any angle using the special annotations. – The app produces detailed 4k textures for a spectacular view of the heart. Mondly is a great app to enhance your skills as it helps you learn 33 languages right in your living room or study table using augmented reality. You just have to begin your quest by downloading the learning pill which will help you learn new languages for life. – Gives relevant examples such as real-life phrases which help you connect and learn faster. – The smart Mondly listens to your pronunciations and corrects them. Also, the Chatbot helps you improve your skills and answer your doubts. – Practice tests and Daily lessons broaden your vocabulary and you can also interact with other naïve learners. Designing your interior is now going to be fun and hassle-free. The Houzz app will give an amazing and a detailed view after dropping the object in its desired place. The app also shows the various lightning effects on the objects placed. – The app’s library has more than half a million products to try. – The product can be purchased from the app. How does it feel to fill the world around you with GIFs? Quite an adventure to take up, isn’t it? With GIPHY World, it is going to be fun and entertaining to drop the images into videos and photos. Give wings to your creativity and create a colourful world around you. – The recorded video can be posted or shared on the web. 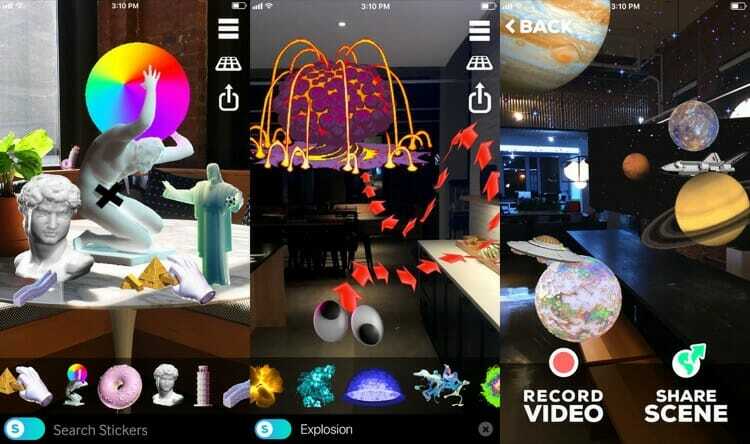 – All the stickers and GIFs will be AR powered 3-D.
Get into the galaxy and explore the constellations, stars, and the cosmos with Start Wars. The app will keep you updated on everything related to the galaxies. If you are a huge fan of Star Wars, then this app is bound to captivate all your attention. – The app can be designed as per user’s interest with different themes and designs available. – You can tweak the characters from Star Wars with emoji’s and share them. This app with the help of Augmented Reality literally brings one of the most loved creatures back to life! Take a walk with your favorite dinosaur, take selfies and videos with them and play with it right in your living room or your favorite space. – Have T-Rex, Triceratops etc around you and make them you. – Table game mode to turn your table into a live Jurassic Park. – Different modes and recording options to have fun. 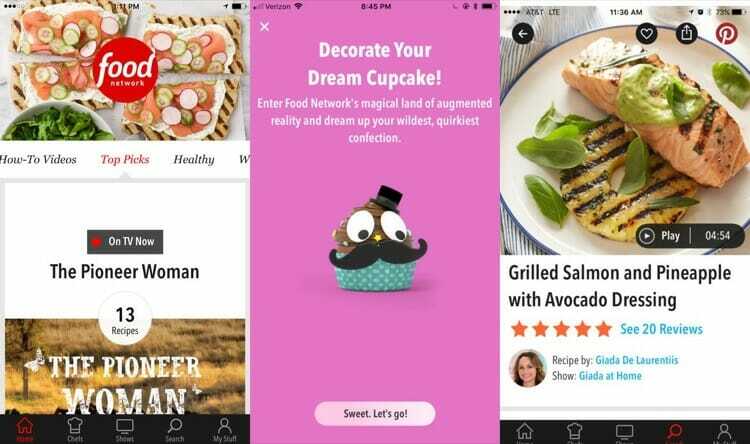 This free AR app is all you need to become a master chef in decorating the desserts and pastries. An instant access to various recipes and saving those recipes are its highlights. You can share your recipes and virtually designed deserts with your friends and get appreciation. – You can select the chef and course to narrow down the search for your desired recipe. – You can browse over 7,000 recipes and get inspired to try your unique recipe. Augmented Reality apps for iPhone XS / XR / 8 are going to take our imagination and experience a step forward into the upcoming future. Unlike the virtual reality that locks the world around you and immerses you in a virtual gaming environment, Augmented reality lets you interact with the world. Explore the above-said iPhone XS / XR / 8 AR apps and make the most out of your new iPhone experience. Full Disclosure: This post may contain affiliate links, meaning that if you click on one of the links and purchase an item, we may receive a commission (at no additional cost to you). We only hyperlink the products which we feel adds value to our audience. Financial compensation does not play a role for those products. Sanjeev is an IT Consultant and technology enthusiast. He has more then 15 years of experience in building and maintaining enterprise applications. He is been with Android from T-Mobile G1 time but recently shifted to iOS. He loves to code and play with latest gadgets.